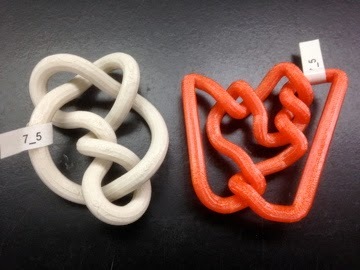 Settings: MakerBot Replicator 2 with our usual custom knot slicer settings. A particularly visual way to make a printable tangle-based knot is with KnotPlot's Rational Tangle Applet that gives you one rational tangle to twist on the top, bottom, left, or right in any direction. This provides a way to visualize the physical construction of the knot but is limited by its inability to follow Conway notation directly. To make specific knots given their Conway notation, it is easier to use KnotPlot's Rational Tangle Calculator. This calculator includes the ability to make, transform and adjoin all the tangles need to follow the usual tangle construction algorithm. 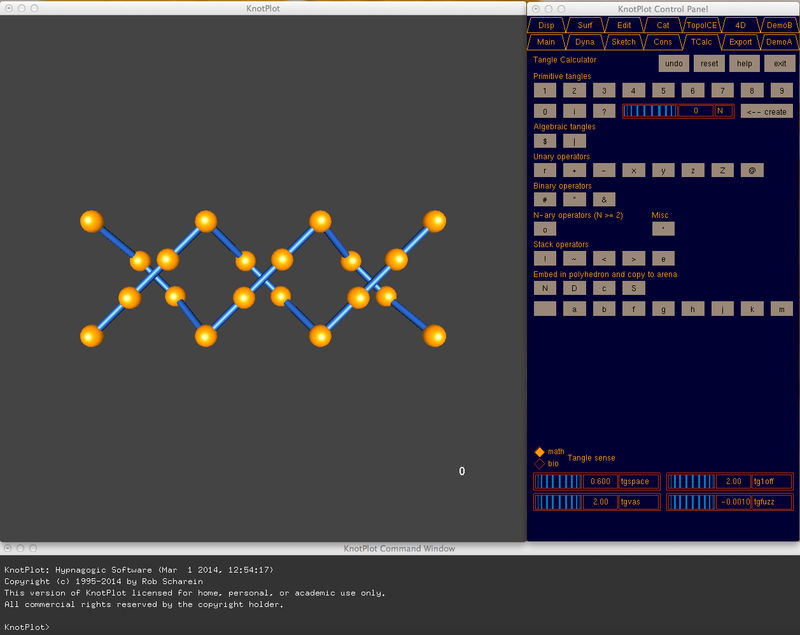 To make the 7_5 model (with Conway notation ), open the KnotPlot Tangle Calculator and click on the number 3 to create the tangle with 3 clockwise rations. Then transform the knot with the r button and press the number 2 button to form the tangle with two clockwise rotations. To adjoin them, press the # button. Then transform them again with the r button, make another tangle with 2 rotations, and adjoin them with #. To finalize the knot, press the N button to make the numerator knot, which is what we want. One this knot is formed, we can export it as an .obj file by going to the KnotPlot command line and typing objout 7_5knot (where "7_5knot" is the title of the file it will create).